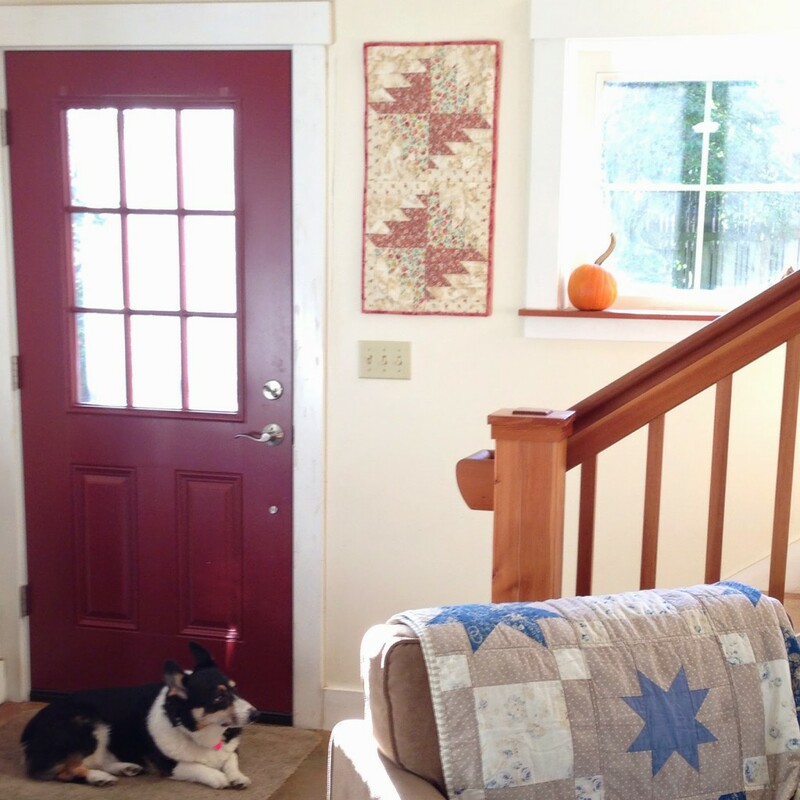 I’ve been wanting to make a small wall-hanging quilt with some Fall colors to replace my tiny tulips quilt by my door. 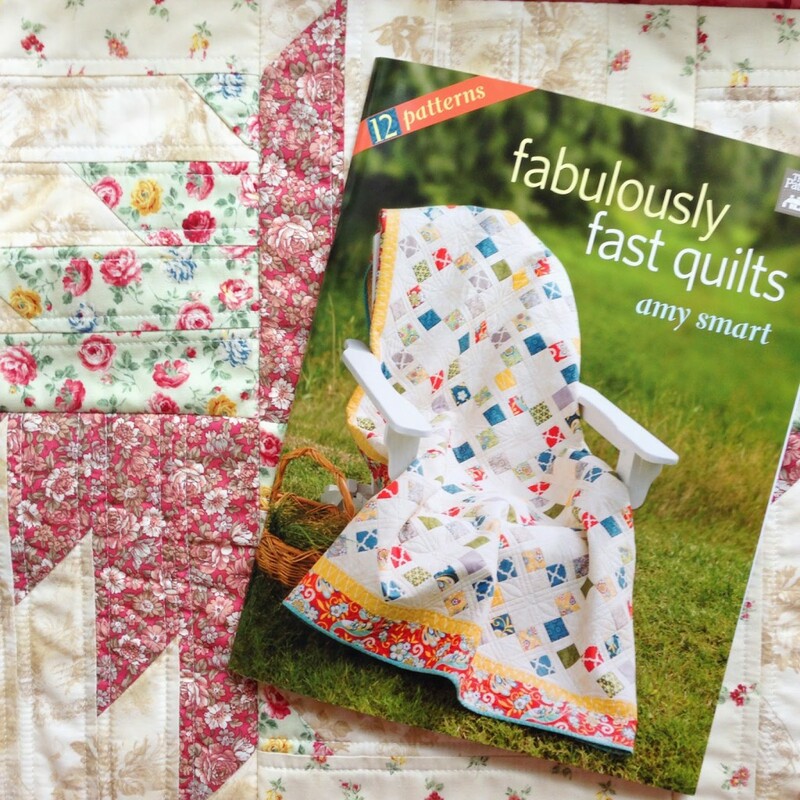 When the talented Amy Smart of Diary of a Quilter sent me her new book, Fabulously Fast Quilts, I quickly fell in love with this particular block. I’ve always loved the look of this traditional block pattern but have been intimidated to try it – it looks complicating! Amy’s book explained how to make it in a couple of simple steps, and before I knew it I had made 8 blocks! 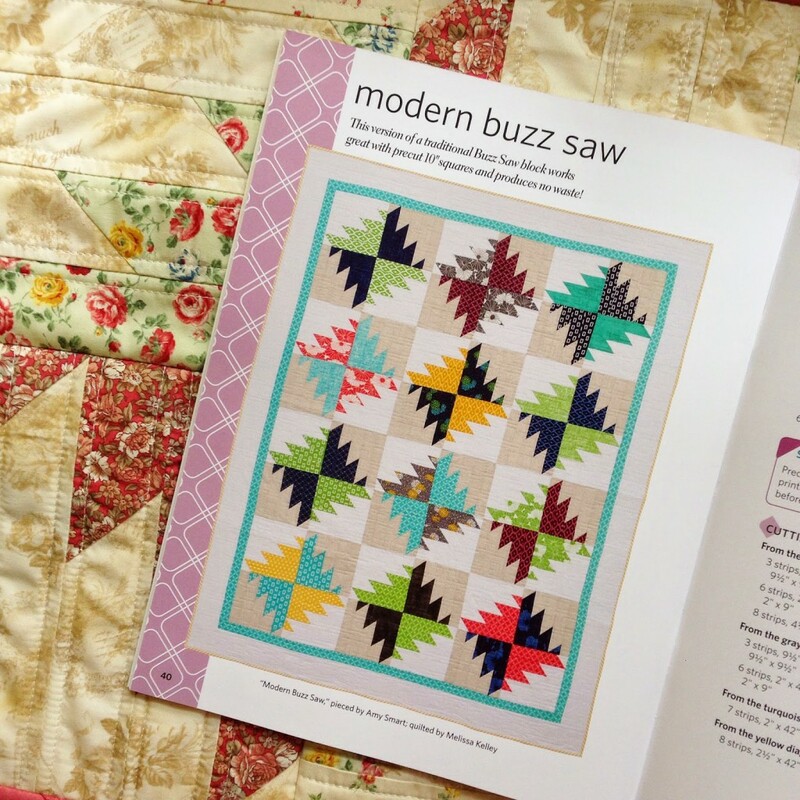 The pattern in her book is called Modern Buzz Saw (it’s also Layer cake friendly!). One of these days I plan to make the full quilt because the blocks really do come together fast! For those of you that have been following me, you’ll know that I like it simple but creative! Amy’s book get’s right down to business with complicated-looking patterns, but simplified with a modern twist so that even a beginner quilter could make these patterns. To finish this quilt I decided to quilt-as-you-go (QAYG) to just get it done. 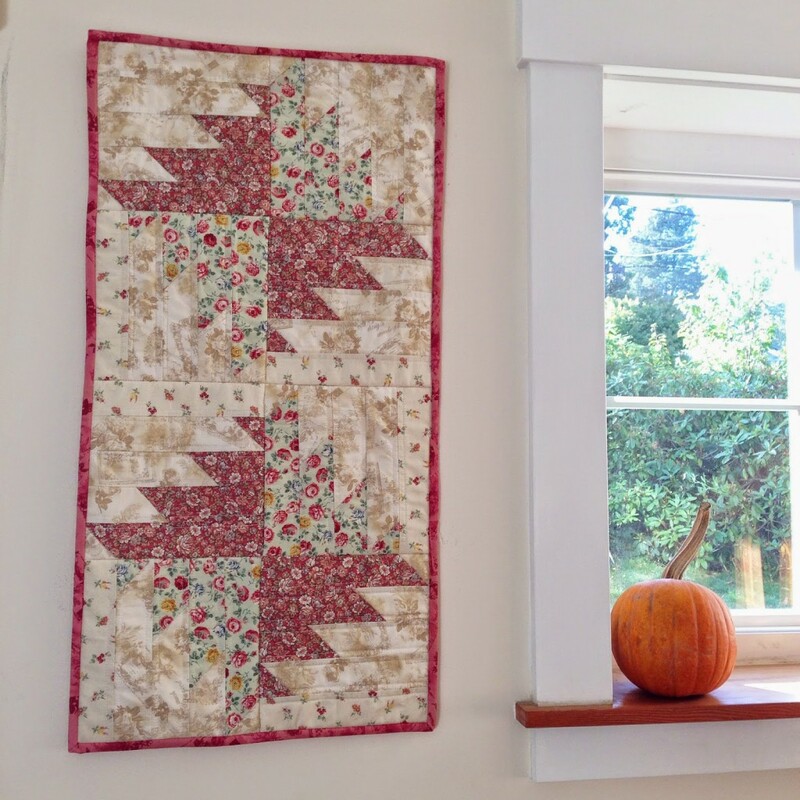 Although a lot of my patterns in my book, Quilt As-You-Go Made Modern, have an improvisational twist on quilt patterns, there is also the option to finish any quilt using the QAYG technique (details on page 32). 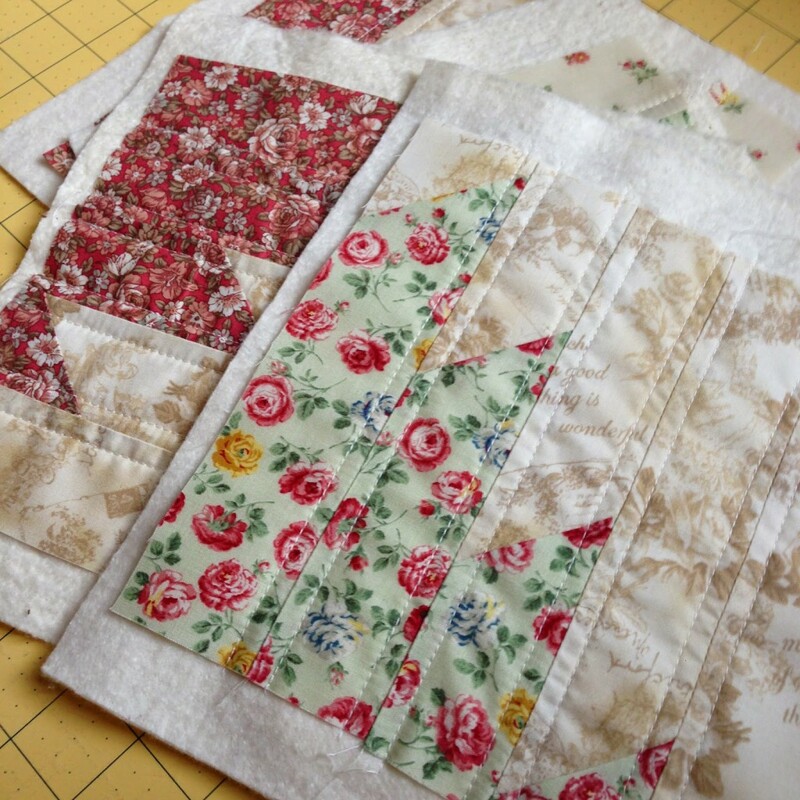 So in other words, you can take any quilt pattern and assemble the blocks ‘traditionally,’ but then finish it using the QAYG technique. It’s great to have so many options! 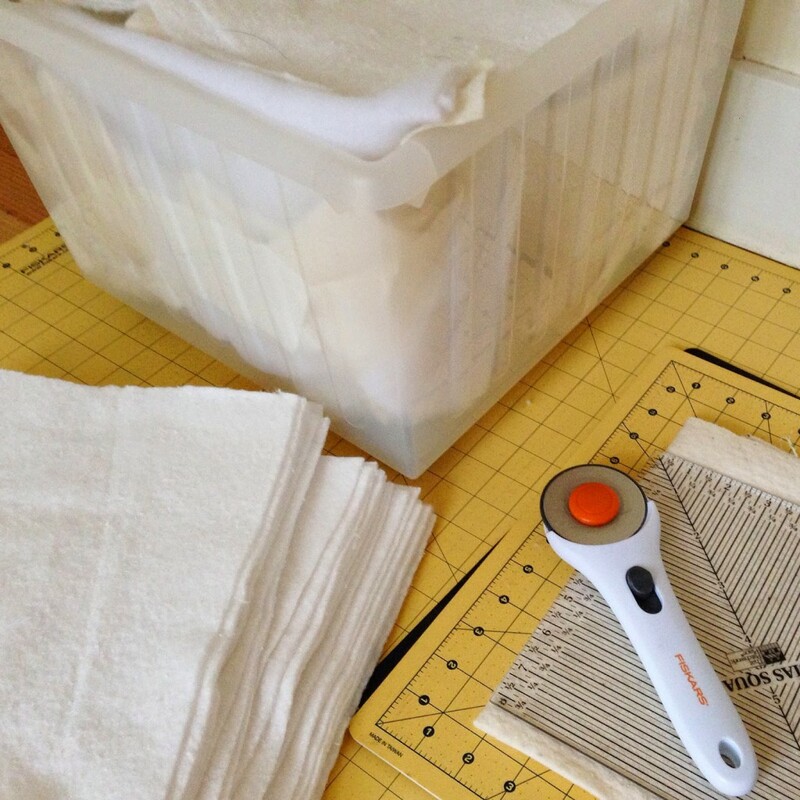 It’s also a great way to use up those batting scraps from other quilt projects. Don’t throw away your batting scraps people! I like to save all of my scraps in a bin that I roll under my table. 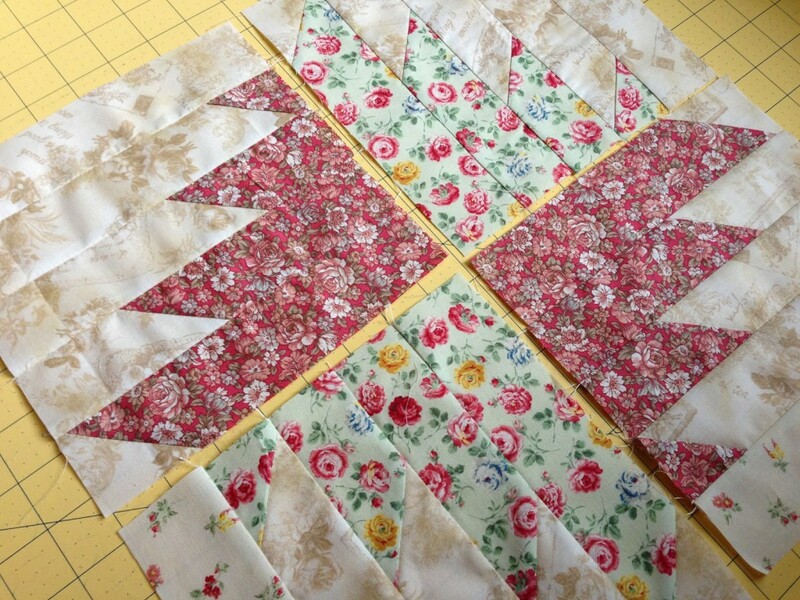 When I get the chance, I cut the scraps up into squares so they’re ready for a QAYG project. 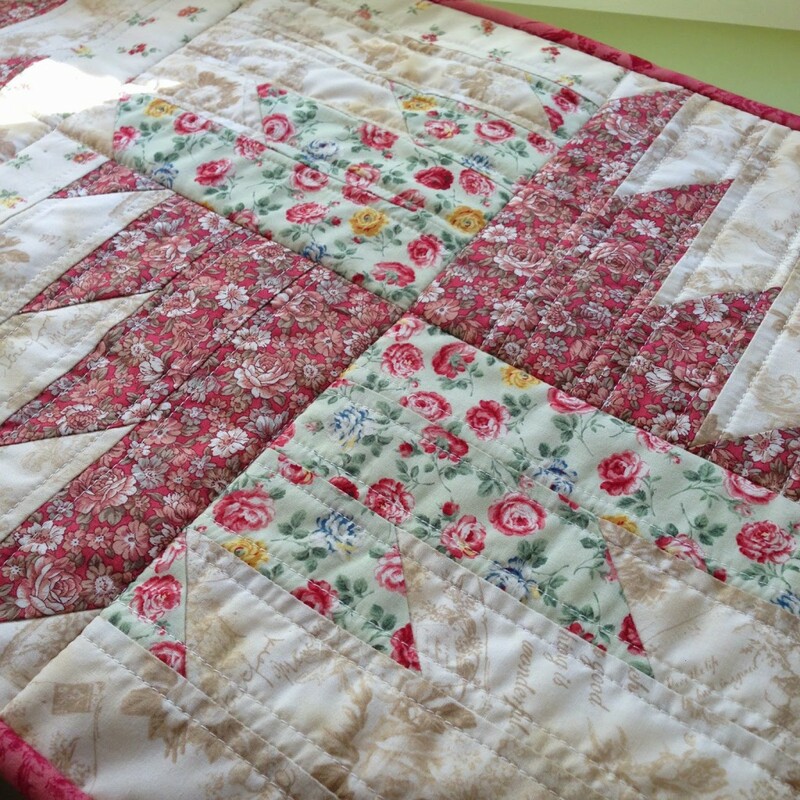 For this lovely block I quilted lines along the seams to give it a clean finish. The fabric patterns are kind of busy so I thought some simple quilting would compliment it the best. And here’s the lovely block after it’s been assembled. Thanks for stopping by! Though I only made a small wall hanging, it sure feels good to accomplish something! Lately, mini quilts seem to be my saving grace. 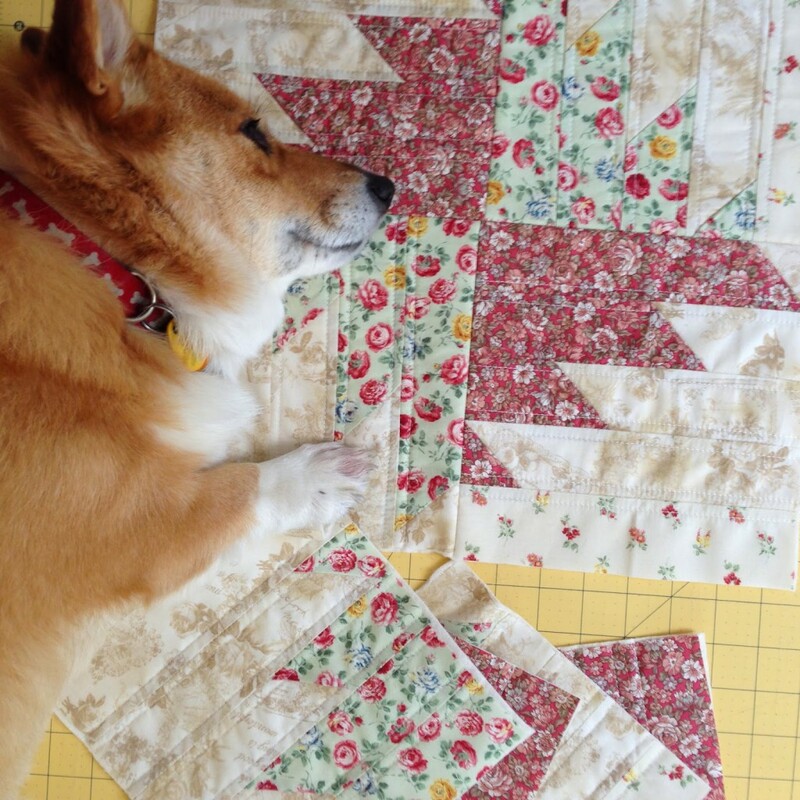 Such a beautiful quilt and love your fabric choice.Great job! The patterns is in the book Fabulously Fast Quilts. The quilt as you go technique is in my book Quilt As-you-Go Made Modern. Details in this blog post. Your book just arrived yesterday and I read the whole thing last night. It's awesome!! You have so many great ideas and variations, and the pictures are fabulous. Thanks for showing us this latest project – there are so many great traditional blocks, and to use QAYG is genius!! Thank you, Sarah! =) So happy to hear you like the book!! 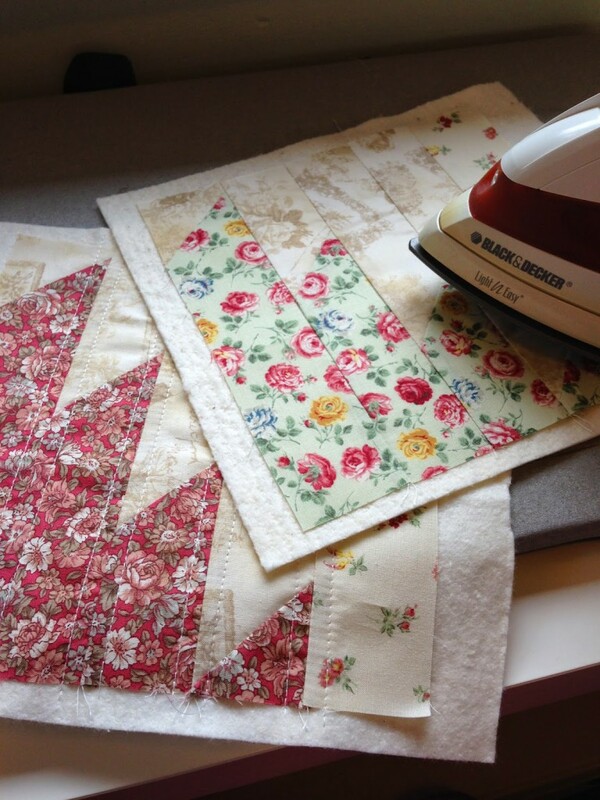 happy quilting-as-you-go ! I'm a newbie to this sort of quilting which bk do I start with? 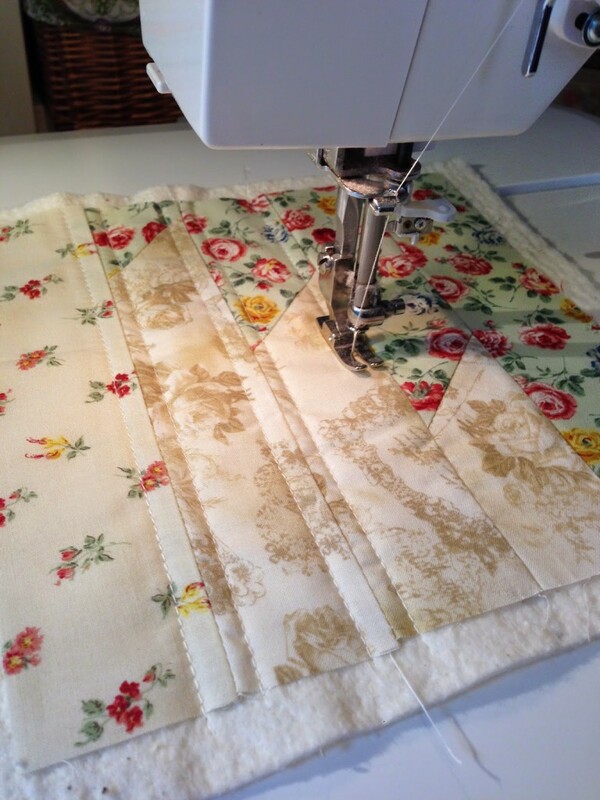 I am a great quilter & know the ins & outs but I need to get started somewhere. By bk i'm assuming you mean book? If you want to learn the Quilt as-you-go technique, then get Quilt As-You-Go Made Modern 😉 have fun! Love the little quilt and have bought your book. Admittedly I bought the ebook because if me DH saw another book come into this house I would be in big, no HUGE, trouble. I bought this book and pieced my first QAYG quilt today. This technique is fast and easy! !